Improve Circulation With Compression Socks | Podiatry Associates, P.C. ?Can compression socks help with diabetes? True or false: all socks are the same. Hopefully you know the answer to that is a resounding “false.” Socks and stockings come in a wide variety of types with many different purposes. One such type that can be very helpful are compression stockings. This special hosiery can improve lower limb issues swelling and circulatory problems. Compression for your feet and lower legs actually has many benefits. It helps discourage swelling, which is why it’s often used to treat injuries. The gentle squeezing prevents the leaking fluid that causes swelling from pooling in your feet and ankles. This is particularly helpful when you spend extended periods of time sitting or standing without a break from either position. Both can actually contribute to swollen feet. Some long-distance runners also find compression beneficial when they hit the trail, which has given rise to sports-based calf compression sleeves. It can also help improve side effects from poor circulation, including spider veins, aching, and sometimes blood clots. Feet with poor circulation often struggle to return blood to the heart after it has flowed down into the extremities. The socks act as extra external support for weak veins, holding them in place so they’re less likely to leak and develop problems. This also makes it easier for blood to flow back to the heart. Compression socks are able to do what they do because they mimic a natural body function. Your body uses your muscles to help pump blood and excess fluid through the vessels. As you walk, your muscles contract and squeeze your veins. This keeps fluid moving against the pull of gravity and back up toward your heart. When you have weak veins, the vessel walls may be too stretchy and allow blood to fall backwards toward your feet. Compression helps support those vessels and act like “extra muscles,” squeezing blood back upward. This then alleviates a variety of uncomfortable symptoms from blood and other fluids pooling in the feet and legs. The key is to find a pair with the right amount of compression for your needs. Finding the Right Pair with Podiatry Associates, P.C. Dr. Cynthia Oberholtzer-Classen will need to examine your feet to determine what you need in a pair of compression stockings. Some types of socks are better for active people, while others benefit a sedentary lifestyle. Some socks are tighter than others, too. If they are too tight, they could actually cut off circulation instead of benefitting it. If they are too loose, they won’t provide enough compression for you. Our staff will use tests to determine the size and strength of stockings you will need. 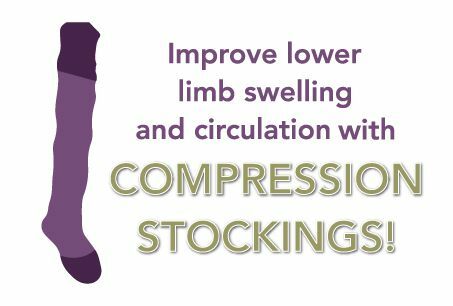 At Podiatry Associates, P.C., we understand the importance of finding just the right pair of stockings to benefit your lower limbs. Our Wellness and Shoe Center is dedicated to connecting people with the medical resources and products they need. We will help you not only determine what kind and strength are right for your feet, but also help you find and be able to purchase them—so you know you’re getting high quality medical socks. Ask at our Castle Pines, Cherry Creek, Parker, and Aurora, CO offices for more information. You can call (303) 805-5156 or use the online contact form to connect with us, too.